Guys, you’ve never had lasagna like this before. Trust me. Have you guys tried macadamia nut ‘cheese’ yet? You know how I love my tofu ricotta, but this macadamia version is ridiculously easy (no soaking required!) and very close in flavor and texture to the real thing! Plus, it turns out all fluffy and cheesy and green from fresh basil. Ooh mama. In place of noodles, I opted for ribboned (thinly sliced) zucchini squash, but you could also sub eggplant, sweet potatoes or gluten-free lasagna noodles. You could also use the macadamia ricotta to adapt my Spaghetti Squash Lasagna Bake for another delicious lasagna-inspired dish! This would make the perfect weeknight meal when you want something hearty, healthy, and more special than pasta and red sauce (not that there’s anything wrong with that). It’s delicious on its own but would also pair well with a Garlicky Chickpea Salad or these Vegan Pesto Parmesan Breadsticks (not GF). 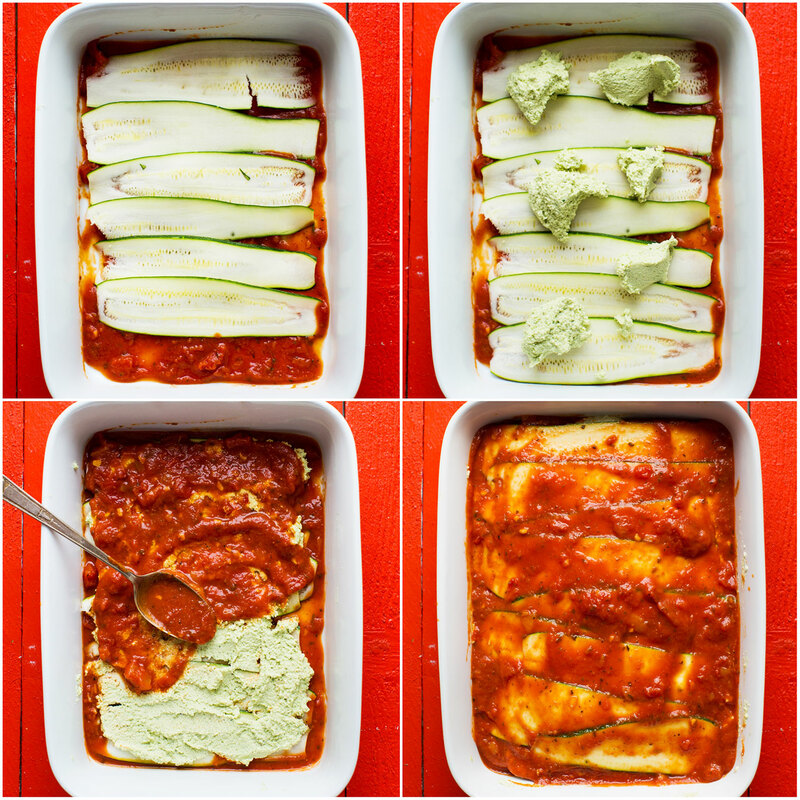 Healthy, 8-ingredient lasagna made with zucchini noodles, organic red sauce, and macadamia nut 'ricotta' cheese! Hearty, wholesome and so delicious. Add macadamia nuts to a food processor or blender and mix to combine, scraping down sides as needed. You're looking for a fine meal. Pour about 1 cup (amount as original recipe is written // adjust if altering batch size) marinara sauce into a 9x13-inch (or similar size) baking dish and line with thinly sliced zucchini. Scoop small spoonfuls amounts of ricotta mixture over the zucchini and gently spread into a thin layer. Spread on a layer of marinara sauce and then top with more zucchini slices. Continue until all filling and zucchini are used up. The top two layers should be zucchini and then sauce. Sprinkle on vegan parmesan cheese (optional), and then cover with foil. *If subbing tofu, make sure it's firm (not silken). Adjust seasonings as needed as the tofu requires a little bit more nutritional yeast, salt and basil. *Nutrition information is a rough estimate calculated without vegan parmesan cheese or olive oil. Divine, one of the best vegan dishes I have ever made. Carnivores loved it and could not believe there was no butter or cheese or cream in it : ). I used macadamia nuts for “ricotta” – texture and flavor was perfect. Divine, one of the best vegan dishes I ever made. Carnivores loved it and could not believe there was no butter or cheese or cream in it : ). Whoop! Thanks for the lovely review, Ewa! Yummm! Is it possible to use almond flour in place of blanched almonds? Hi Molly, we don’t think that would work! The texture would be off. Hope that helps! I’ve made this twice now and both times I’ve been amazed! It is seriously sooo delicious. Being “vegan paleo” it’s tough to find exciting new recipes, your stuff is unbelievably delicious. For this recipe I ended up changing some things around only because I was trying to use some stuff up (and was dreading a Whole Foods trip). I substituted cashews and blanched almonds (soaked for an hour) for the macadamia nuts. I only had 2 zucchinis so I used some leftover calzone ingredients: mushrooms, bell peppers and red onion- in place of one of the middle zucchini layers. Last and most importantly I had leftovers of your incredible raw walnut taco meat and mixed it throughout. It’s seriously my new fav meal. Your recipes are amazing, thank you so much!! So delicious! I user Kite Hill ricotta, my own vegan Parmesan and alternated zucchini with Trader Joe’s frozen eggplant. Excellent! This was one of the best dishes I’ve ever made. Hands down, this dish got my kitchen engine revved up again. Thank you so much for sharing! I made the recipe almost exactly as written, except for the basil in the ricotta – I subbed half for fresh spinach. It tasted amaze balls. Quick question: I used my vegetable peeler and I couldn’t get my zucchini strips as long or uniform as yours. What appliance did you use? So glad to hear it!! We use this mandolin to make uniform zucchini strips. This is so delicious! I’ve gotten rave reviews from meat eaters and vegans alike. Already made it 3 times in a month. So excited I found this recipe. Works well with dried basil too. 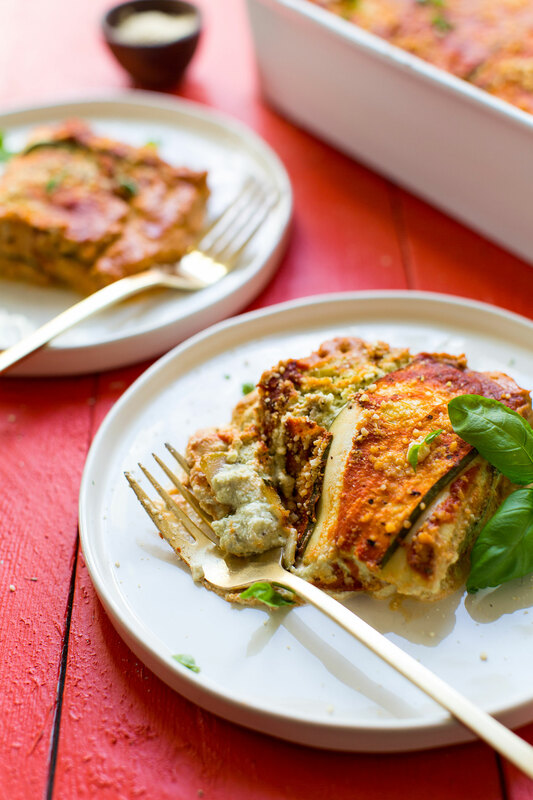 I made this recipe (and actually combined it with the sweet potato lasagna recipe, layering both zucchini & sweet potato and topping with the pesto sauce). Soooo delicious. My one thought is to consider making macadamia nuts the alternative, not the default, nut for the recipe, as they may be cost-prohibitive for lots of people, with 3 cups costing from $15-$20 (in my experience). I love the vegan cheese alternative, just wish the starting point was something more accessible. Anyway, I make your recipes all the time and enjoy them so much!! So delicious! BUT…. it was so watery! I made the ricotta from tofu, and I did press it for 20 minutes, so it was very dry…. what did I do wrong? Made as directed with tofu, with the extra basil, nooch, and salt as suggested. This tofu ricotta… SO GOOD! The only change I made was adding prepped TVP granules to half of the tomato sauce to give it that “meaty” texture. Made half the pan with plain red sauce and half with the “meat” sauce. Highly recommend trying with the TVP, it gives it a bit more texture and heft. It came out a tad watery, but thats likely due to not being able to press much water from the tofu. I used 2 cups macadamia nuts and 5.5 oz tofu (cubed and drained) and NO additional water and this was AMAZING. Thank you! After I sliced my zucchini, I lay the strips on paper towels with another layer of towels on top , then pressed and this worked great. I didn’t add the additional water that the recipe recommended. My lasagne was the perfect consistency! For freezing what is the best route to go? Cook it as instructed then freeze? Or do I assemble it then freeze it for later when I’m ready to bake it? Also, how long and at what temp? Hi Sal! You can freeze this dish baked or unbaked and then thaw it at 375 degrees F (176 C) until cooked or warmed through. Someone made this at a diner party and I was so wowed by how fantastic it was! I have a question about the Macadamia nut measurements. Is the 3 cup measurement for whole, halved or chopped nuts? OMGOSH!!!! This was incredibly delicious and extremely outstanding. My sister and I made this for the first time for Christmas dinner 2018. We added layers of sauteed onion and fresh spinach and alternated the layers of fresh zucchini with layers of fresh eggplant. I cannot believe how much this tasted and looked like the pasta and cheese lasagna we grew up on in our Italian home. You all must try this recipe! It’s quite simple and quick to assemble. The hardest part is waiting for it to bake!! Enjoy! Can I prepare this a day or two ahead of time and leave in the fridge until I’m ready to bake? I hadn’t eaten or made lasagna since my husband went gluten free 5 years ago and he’s since gone vegan as well. I thought I’d give this a try to satisfy a hankering I had for lasagna. It did not disappoint! I used the tofu option for the ricotta and it was delish. I had forgotten to get fresh basil, so I used dried. I imagine it will be even better using fresh. I sliced the zucchini using the thickest setting on the mandolin and it was perfect. As it was cooking the kitchen smelled like lasagna. 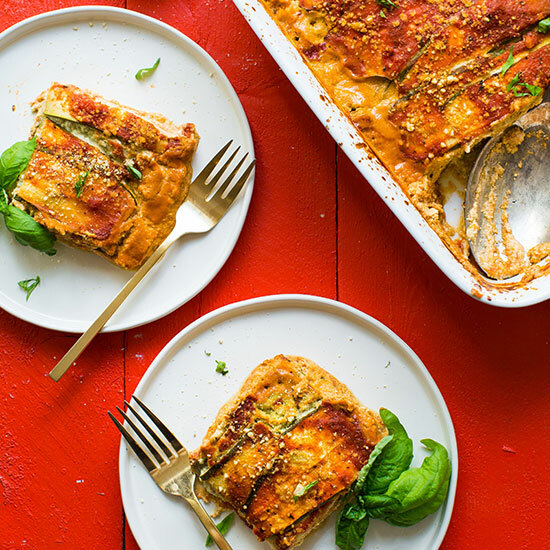 I’m so excited to be able to give us all a lasagna fix without all the carbs and dairy, yet with plenty of taste. I would really love to make this. Would it be possible to substitute the nutritional yeast for something else? For allergy reasons? I like the idea of a macadamia nut cheese, as my recipe can’t have most other “cheese” nuts (almonds, cashews, etc) but the nutritional yeast is a no go as well. Hi! If you can’t have nutritional yeast, I would recommend just leaving it out for this recipe! AMAZING — a new favorite dish — even my omnivore family loved it. – I laid the sliced zucchini out and salted it, let it sit, blotted it, and repeated a few times until I felt like it wasn’t sweating anymore. After this step, you could also grill it to remove even more moisture, but I didn’t. – I drained as much excess water from the spaghetti sauce as possible before using it. – I only used spaghetti sauce on the very bottom and very top. Layers in between were just zucchini and ricotta. I served it with a bowl of marinara on the table so you could add more at that point if you wanted it. – I cooked it uncovered the entire time. Delicious! Have already forwarded this recipe to my fellow vegetarians and vegans! Yay! Thanks for sharing your changes, Carleigh! So excited to find your recipe, I have everything ready, The vegan ricotta is delicious, but have not sliced my zucchini, not serving until Sunday how far ahead can I make it and leave in the refrigerator without getting soggy? Love this recipe – it pleases everyone :-) I cook a cup of lentils in the sauce and add whatever veggies I’ve got leftover in the fridge, e.g. mushroom, corn, peas, etc. Love it! If you’re a single person or cooking for 1-2 since it lasts 2-3 days in the fridge, 1/3 of the recipe is perfect and I used cashews instead of macs/tofu/almonds and it was wonderful! I cooked it first for 30 min covered, then 15 min uncovered. I know it’s probably annoying hearing people butcher your recipe by changing this and that for this and that, sorry about that! I used a square pyrex I think 8×8. Not at all! Thank you for sharing your recipe changes, Rachel! This recipe is delicious! Our family of 5 ate the entire 9×13 in one night. Haha. My changes: I didn’t want to spend $15.99/lb on macadamia nuts and I use cashews when I make our “queso”, so I tried organic almonds ($7.50/lb)! It’s so so so good. I had to use more than 1/2 a cup of water, but the consistency was great. I also used two jars of sauce. I’m not sure how I couldn’t layer multiple times with just one jar! Sprout’s has their sauces on sale, 2 for $5, and the flavor was awesome. I used one jar of traditional marina and one of the tomato basil. nuts, excellent. Saving this recipe for sure. I used a cup of macadamia nuts and 8oz of tofu. The tofu had been frozen and defrosted which made it crumbly. The texture was wonderfully fluffy and light. I used courgette and gluten free lasagne noodles and stacked it up. A beautiful supper and delicious too. Thanks so much for the recipe. Great! Thanks for sharing, Katie! Yes, the tofu may have been crumbly from being frozen and defrosted but we are glad you enjoyed the dish! I made this with tofu ricotta and added extra veggies in the layers. It’s incredible! The star is the show is definitely the ricotta. I’m not a huge fan of plain ol’ cubed and fried tofu, I need to find more recipes to incorporate the tofu ricotta. This recipe is so freakin delish. Hi Ruth! I’d recommend soaking the cashews for 30 minutes in hot water, but I also haven’t really tried that yet. I also think you can use blanched almonds but haven’t tried that yet either! Let me know how it goes! Loved this recipe! I used zucchini and eggplant in the dish. I also added some onions. I used almonds for the ricotta. I would like to use the Macadamias at some point but they are pricey. whew! My husband, who grumbles every time I make a vegan dish, loved it too! Hi Estera! We are sorry you didn’t have success with this recipe. Did you happen to make any changes? Let us know and we’ll do our best to help you out! I made this last night and seriously my boyfriend almost ate the entire thing he LOVED it. And doesn’t Ike real cheese! The ricotta was amazing. I made mine by mixing eggplant slices and the lasagna pasta and some spinach. I also threw in some vegan mozzarella to make it extra nutty and cheesy. So good! Thank you ! DELICIOUS! Made this with tofu ricotta and used your vegan parm. We both loved it. Planning to make this for an upcoming potluck. Will the zucchini become too watery if I make and freeze it ahead of time? Thank you so much for the recipes. You can freeze for up to 1 month! Delicious, ignored portion control divided it into 5 and everyone loved it. Used almonds but forgot to soak so got a crunchy but wet texture that still was good and in the vegan parmesan used powdered ground Chinese mushrooms not nutritional yeast which gave great flavour. Tip top recipe once again! Yay! Glad you all enjoyed it, Tiffany! Making this tonight! I’m trying to find different ways to use all of the zucchini from my garden and am doing a few of your recipes! preparation took 45 mins, not 20! Looks great though, ready to bake now! Used cashews for the ricotta layers, came out very tasty! Can this be made with regular lasagna noodles? This is a great and creative recipe! I made it today with tofu, next time I will shell out the money for the nuts bc the tofu tends to clump after sitting in the fridge. I’m also going to add lentils next time for a meatier texture, and add an extra zucchini or two, 3 just didn’t give me as many layers as I wanted in a 9×13 pan. Great blog! I will definitely be trying more of your recipes this week and in the future! This was a hit for MY WHOLE FAMILY. My 3 and 1 year old gobbled it up along with my husband and I! I like that it feels like a complete meal, though I did serve it along with some garlic bread. Leftovers were delicious as well, as are most spaghetti type dishes! Will be making again. Also I ended up buying pre-cut sliced zucchini from the local super market. I do not have a mandolin so that was not an option. Though I did consider just using my knife to make long strips, which I am sure is possible but would be time costly and I probably would end up with rather uneven slices! Yay! So glad everyone enjoyed it, Natalie! I love lors of your recipes,but this just climbed to the top of my list. I had a dramatic story with this recipe- last night was too excited to make it that sliced top of my thumb off on a mandoline. After a quick trip to ER and reattaching my bodyparts finished making this lasagna. And its torally totally worth everything i went through ? i followed the recipe exactly(only used less zuccini as my sauces finshed up) and it turned out perfect,not watery whatsoever how some ppl mentioned! Can’t wait to make it again for a family gathering! Thank you for your recipes!!! Can you pre-cook and then freeze? Yes! It keeps in the freezer for up to 1 month! You can freeze lasagna baked or unbaked! I want to say that in the process of cooking this I ended up cutting a large chunk of my finger on the mandolin. But this was worth it! So incredibly tasty and cheesy even my boyfriend loved it. I made the recipe exactly as written and ended up spending $18 CAD on macadamia nuts but if your in the mood for something special this is worth it (and cheaper then a steak dinner). My only comment was that it ended up not holding together very well but it all ends up that way in the stomach and I will probably cook it longer next time. Phenomenal vegan ricotta recipe! I used half tofu, half cashews soaked 30 minutes in hot water, followed the recipe as written, then added a pinch of nutmeg and sugar to make a traditional manicotti filling. Baked up delicious with brown rice manicotti, marinara, and a generous sprinkling of your vegan parm. :-) Ricotta is one of the few dairy items I legitimately miss eating, such is the delicacy of its fresh cream flavor, but this was so surprisingly good, I really wasn’t even jealous as my boyfriend chowed down on the pan of traditional dairy manicotti I made for him! I’ve made this twice now – both times with a combo of almonds and tofu (about half and half). I didn’t take the skins off the almonds or press the tofu; just added only a bit of liquid until it was the consistency I thought it was supposed to be. The first time I made all zucchini layers but second time I did a combo of zucchini and regular lasagne sheets. Both times it turned out amazing! This will definitely be in regular rotation and I can see there could be so many variations like some others have commented with mushrooms, lentils eggplant etc. Just made this following the recipe, it was delicious! Foolproof and easy to make. It is my first time ever making vegan cheese and I am really impressed. The nuts were pretty pricy though so I’ll have to look out for sales, or perhaps try the tofu next time. I’ll definitely be trying some other recipes on this site! I made this for Christmas dinner 2017 and it was beyond fabulous in flavor. I also made a meat entree. The non-vegans who tried the lasagna went back for seconds. Hey, I’m blanching the almonds myself right before I cook this dish. Do you think I should still soak them? Or should I go ahead and make the ricotta since they’re freshly boiled? They should be ready to become ricotta if you’ve just blanched them! I used almond flour and a tablespoon of almond butter-delicious. Perfect solution for those that cannot eat cashew or macadamia nuts. Thanks Dana, you have me thinking and cooking outside of the box. Eating WFPB is easy and delicious with your website. I plan to order the book-all of the recipes I have tried from your website have been amazing. I don’t understand all the rave reviews! Mine was so watery it was basically soup. The Ricotta was delicious. I made it with the Tofu and it was out of this world! Tasted just like ricotta. But other than that, it was wayyyy too watery. Hi, I tried this dish with firm tofu and dish was mush. The taste was good. OMG. All I can say is, all hail Minimalist Baker! I have made so many of your recipes and still am amazed at how delicious every dish tastes. This is my new all-time favorite recipe. I can’t believe how similar it tastes to lasagna, but also EXCEEDS the taste of regular lasagna. Is that possible? Is this magic? Thank you thank you!! 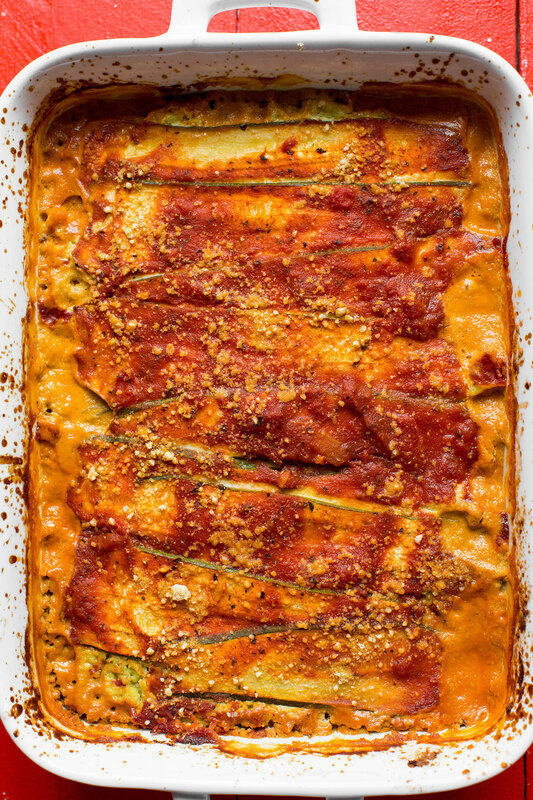 I made the lentil eggplant lasagna with the vegan ricotta from this recipe. It was so delicious! OH MY GOODNESS!!! I made this last night- it is seriously one of the BEST recipes I have made since going plant based, and I’ve made some seriously good food! I love to cook, am not a newbie, and often just convert my favorites to plant based. I was craving lasagna yesterday- looked up some plant based recipes, chose yours based on reviews- and WOW! Was so good!! I made my own sauce, as I always do. I salted and rinsed the zucchini to make it less watery, and I subbed 1 cup Brazil nuts and 2 cups almonds, as that is what I had. I also added fresh garlic and some sundried tomatoes to the filling. Those were the only changes, but that’s because that’s what I would normally do. My family was all raving- my carnivorous, cheese loving son-in-law could not believe it wasn’t real cheese! Thank you so much Dana!!! TO EVERYONE—–MAKE THIS TODAY!!! you will not regret!! This is now my go-to recipe for dinners with friends — have made it many times and it’s SO GOOD. The macadamias are definitely pricey but they are worth it for the delicious, rich flavour. The tofu option is also good though :) I added a couple of layers of g-free pasta sheets in mine to soak up a bit of the extra tomato sauce. Love it! Just made this lasagna tonight. I thought it was good but would make some alterations next time. I used the almond method because mac nuts are so darned expensive. I tend to like a lasagna on the saucy side so next time I would cut the cheese filling in half and add a bit more sauce. The flavors were good but when I served a piece it felt like I had mostly cheese, and I would prefer heavier on the zucchini and sauce. I also think it would be great with some mushrooms added in! WOW. This recipe was amazing. Didn’t even miss anything about “regular” lasagna, this was so much better. My ricotta – I did follow the recipe, but didn’t get it to spread well, so just did dollops all around, and crossed my fingers. Still turned out perfect! I made this today and it tastes absolutely delicious! This was my first time making almond ricotta and can I say that it didn’t disappoint! I can’t wait to make ravioli’s with it. I so don’t miss the dairy ricotta. Thanks for the recipe! I made this for the first time last night and OMG! My husband and I LOVED the flavor and texture of the macadamia nut “ricotta.” Thank you for your inventiveness in the kitchen! I used almonds instead of macadamia nuts and it worked out pretty good. Though taking the time to blanch the almonds was pretty time consuming. I added in some black beans in the layers for some extra protein which I felt worked really well. Could you add the tofu to the marinara sauce instead? I would like to keep the macadamia based ricotta cheese but I could also use the extra protein. Hi Stef! That should work! So good! I was worried by some other reviews that it would be watery, so I made a few adjustments. After slicing my zucchini I roasted it at 400 degrees for about 6 minutes, and I made the tofu cheese and didn’t add any water. It didn’t come out watery at all. Thank you for another wonderful recipe! Let me start with saying I’ve subscribed and will follow you on Facebook and IG. I do not want to miss a beat with you. Your culinary skills are off the charts! I’m so lucky to have come across your site. This is by far the best lasagne I’ve ever tasted. I’m ordering your cookbook and can’t wait to try other recipes. I made this tonight and it turned out incredible (even got rave reviews from the meat eaters). The only change I made was adding a couple layers (over then cheese layer) of super finely chopped spinach dusted with garlic powder. The sauce I used was Mom’s – which had whole lead basil and whole garlic. Oh, I also sprinkled in a bit of vegan mozerella on top and on the cheese layers. Did not miss the pasta at all! This is super tasty!!! I’m not a vegan or even a vegetarian by any stretch of the imagination but I’ve been turning to some vegan and vegetarian recipes to balance out my diet. I’ve been having success with your recipes! I did use the tofu modification because I can’t have too much nut fats with my diet. I also add some dairy cheese to the top for some gooeyness. I’ve made this for company and everyone loves it. Definitely take the time to salt and drain the zucchini, and I dab the excess water off with paper towels before layering. I also find that letting the casserole rest for 20 minutes or so helps firm things up a bit. So fantastic!!! I made it with eggplant and macadamia nuts. Oh my word! It’s fantastic with the vegan parm. My parm was on the crunchy side and I didn’t think it would work, but all the flavors are on point. I may never buy ricotta cheese again. I have made about 30 of your recipes and my husband and I who are new in the vegan world love every single one of them. The zucchini lasagna was absolutely delish. I made it with blanched almonds and I couldn’t believe how much it tasted like the real thing. Thank you for your creativity and talent. Blanched almonds? Soak in hot water for an hour then drain and peel? If I made the ricotta ahead of time will the texture hold up? First time making vegan cheese over here! Yes, it should! It has a fairly soft texture to start, but you can make it ahead. I made this last night and it was delish! I used extra firm tofu for the ricotta cheese, made sure to press for 10 minutes. I only added 2 tablespoons of water, doubled the nutritional yeast and fresh basil and added a little extra salt. I topped it with my own homemade vegan parm (cashew, nootch mix). It didn’t come out watery at all. With a side of vegan caesar salad and garlic toast, this was a hit and I will definitly be making it again. This is so delicious! I have made it three times. However, every time I make it- it comes out super runny more like a soup. I have tried leaving out the water but it doesn’t help. Do you have any suggestions? Maybe sweating out the zucchini? or adding more solid vegetables? Also- i am using macadamia nuts. Made it twice already (eating it right now) and its absolutly awesome! I use the tofu and combined it with some mushroom-pesto I still had in the fridge and topped it with vegan cheese. So I really like it, but I had a problem, both of the times I made it. The tomatosauce selfmade/bought always is too thin and I and up with a lot of liquid. You could try adding some cornstarch to thicken it? This was absolutely delicious and so easy to make. I used tofu rather than macadamia nuts as they were quite expensive! Another amazing recipe! Seriously! Where did you come from!! We lov d this! Made it with zucchini noodles and added some shredded carrot and spinach. It was amazing! Torn between trying it with gluten free noodles and sticking with the low carb zucchini noodles! But either way fantastic! Wondering does it freeze well? Hi! It keeps in the freezer for up to 1 month! I am new to cooking. I am making this yummy and easy to follow recipe. I want to freeze it for a friend I will be seeing in 10 days. What do you suggest I use to freeze a portion for 2 people and what instructions should I give her to reheat, please? Thank you! I made this last night and needless to say it was delicious. First time trying macadamia nut cheese…but the taste was incredible and worth the extra expense. (Traders joes has the best prices on macadamia nuts that I’ve found)… Based on other comments I may try it next time with sauteed spinach and mushrooms to up the layers. Can never go wrong with more healthy veggies! Thank you for sharing this amazing vegan lasagne. I made this dish last night and it was delicious!! Both my husband and I loved the flavor of the mac nut “ricotta” cheese. I think using fresh herbs (I also used fresh oregano) always makes a dish taste better. I don’t have the nicest blender, should I soak the macadamia nuts before I try and blend them? I am able to blend soaked cashews fine. I tried making your Nutella with hazelnuts and my blender had a difficult time blending them up. Or should I just use the tofu or soaked almonds/cashews instead? Would Trader Joe’s Almond Meal work in this receipe as well? Hi Sarah! What would you be trying to replace with almond meal? Can I make the “ricotta” ahead of time? I’m making more than 1 dish and any prep work I can do ahead of time would really help out. Yes! Make ahead and refrigerate! I made this last night and it is SO GOOD. I’m going to be making this way more often now. I love lasagna but felt so guilty after scarfing down so much pasta, but this recipe is perfect. Dana, do you have any suggestions on how to avoid a watery end product? I spent about 15 minutes using a turkey baster to remove excess liquid (those damn zucchinis did me dirty again). I ate it after draining it, (which was worth it) and oh boy, I’ll never eat lasagna with noodles ever again. Thanks for this amazing recipe! I made it last night for a dinner party with non-vegans, using zucchini and eggplant and a mix of tofu and almonds – it was a big hit! Consistency was great and flavor just yummy. Everyone loved it and asked for the recipe. Easy to make and simply delicious. Will definitely make it again. I made this using cashews instead of macadamia nuts & regular lasagna noodles instead of zuchinni & WOW! It was AMAZING! I’m so surprised by how similar in taste + texture to standard ricotta this was! I shared some with my family (non vegan/vegetarian) and they thought it was great as well! Used raw cashews and added egg-free lasagna noodles. Soaked the cashews in hot water for thirty minutes. Amazing!! And leftovers are even better if that’s possible!! I am not on the GF train, in fact I LOVE gluten, but after recently being gifted a TON of veggies I decided to give this recipe a try. I’ve made one other vegan lasagna and it wasn’t great and after reading several reviews above that commented on the amount of “soupiness” I had concerns. I used 1.5 c soaked cashews + 7 oz. of pressed firm tofu (half a container) for the ricotta. I completely ignored the addition of water and added jusssttttt enough liquid to get the consistency I wanted. After baking for 45 min and removing the foil it was super liquidy and I was even more worried. But after another 20 min + you know, following directions, and allowing it to cool for 15 min it was PERFECT. I plan to freeze the remaining 5 squares and make this again and again in the future. I love this recipe. I make it about once a week. I always sub tofu and almonds for the macadamia nuts and double the ricotta recipe. I also use two jars of classico sauce. Love this! I love this recipe sooo much! I used tofu and it turned out amazing. I’m going to try the filling with lasagna noodles and give it to my kiddos and see if they notice that it is vegan cheese. Made this with soaked almonds and it was Delish. Best vegan ricotta I have ever made! This is one of my all time favourite recipes! To make it a little more economical, I use 1 1/2 cups of Macadamia nuts and 1 1/2 cups of soaked cashews. Turns out perfect every time! Thank you so much!!! If I want to make a non-vegan version with regular ricotta, what would I still mix the ricotta with? This was AMAZING. Out of this world good! I made it with tofu and seasoned it up the same way – so good! Also – so freaking easy. This is going to become a staple for me. Thank you for your recipes! I have made so many and they are always wonderful. You have quite a gift! This recipe is quite adaptable! I cook without wheat, soy, dairy, eggs, garlic, ginger, walnuts, pecans, and soy out of necessity. The other comments posted helped me make adjustments as well. I used the mandolin to slice Yam, Zuchnini, Yellow Squash, and Carrots. I thinly sliced Roma tomatoes and Shallots. 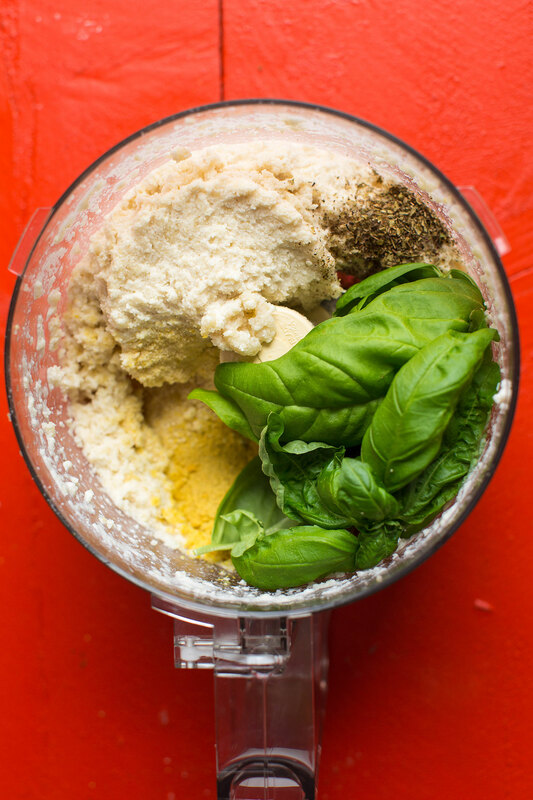 I used fresh basil at the very end of processing the nut butter ‘Ricotta cheese’ substitute. I used black truffle salts, fresh lemon, olive oil and H20 in the nut butter. I used a can of salt free diced tomatoes (no garlic) and a T of tomato paste (no garlic), with 2 T of fresh basil, and 2 T of dried Oregano, and 2T of coconut brown sugar, and blended with the immersion blender until smooth. We had mushrooms on hand, but there was not enough room in the casserole dish to add mushrooms. We froze the leftovers in bento boxes, and the meal reheats superbly. Thank you for taking the time to share an amazing and adaptable recipe! I love all the comments with suggested substitutions. Just wondering if you have an idea how this could be done in the crockpot? My own suggestion — for those with tomato problems i think a tomato-less sauce could be used. Full of Beans have a very similar recipe which ive made a few times, delicious! We made this! It was very good. Next time I won’t add the salt though because our marinara sauce had salt already in it! I just made this and wow it’s incredible! I did not have any tofu on hand so I made the filling with soaked cashews and I used both zucchini and eggplant, roasting the eggplant first. It was so good and so filling! My meat-eating fiancé couldn’t stop talking about how good it was! I love your site, everything I make from sweets to smoothies to granola bars are amazing! Thank you!! Wow, this surprised me with how much it tasted like traditional lasagna. Plus, it was super simple. Very, very well done. Made this tonight with tofu; delicious! I had just a few macadamia nuts and no food processor (away from home at my parents) so I toasted them, then used a pestle and mortar to grind them up with nutritional yeast and salt to make a Parmesan substitute, sprinkled it over the top, and it was the cheesiest home made Parmesan I’ve ever had. Fabulous recipe, thank you! Going to try it with the chickpeas as someone suggested above next time I make it. I only love tofu when it is prepared in a lasagna! I prefer this version more then a version with eggplant, my parents also enjoyed this meal! Wonderful recipe. I’m amazed how much the macadamia nuts lend a cheesy texture/flavor. On another note, I used a mandolin for the first time with this recipe and sliced off the very tip of my finger (had to go to the ER). Be soooo careful if using one. I just used a knife the second time around and it turned out fine! This is a delicious recipe! I used the tofu instead of macadamia nuts for a cheaper route. I also used dried basil instead of fresh (also for a cheaper route and it was a plus that it was right there in my spice cabinet). The measurement adjustment ended up being about 2.5 T of dried basil. I only added roughly 1/8 C water to the ricotta mix instead of 1/2 C. I REALLY wish I had a mandolin because it would’ve saved me so much time and effort. I found it difficult to slice the zucchini into super thin pieces with a knife. Also, I wish I would have used the full 28 oz. of marinara (I used tomato basil like she suggested-super yummy!). I felt as though it would be too saucy with the full 28 oz. when I was prepping it, but the end result definitely could’ve used all of it. 10/10 would recommend and I will make this again! Such a delicious recipe Dana! By far the best veggie lasagna I have ever had – thank you :) I used roughly 1/2 and 1/2 macadamias and almonds to make the ‘ricotta.’ Also, I added spinach, fresh and sundried tomatoes, onion, chopped mushrooms and fresh mint to the layers for extra vegetable bulk. Thank you for those wonderful recipes. I have vegetarian and a gluten free friend and now can put meals on the table everyone can eat. They look absolutely delicious. This was SOOOO delicious! My self and my mom are the only ones in our house that are vegan, but everyone including the meat eaters loved it! It’s wild how it takes so much like regular cheesy lasagna! Definitely going to add this to our regular meals! Thanks for the recipe! A healthy lasagna = AWESOME! thanks for sharing this. I hope this will taste like a normal lasagna. It is called extra firm silken tofu. Is that the wrong kind? Thanks! I use extra firm NOT silken! Just read your recipe and this looks great. Is is a perfect evening meal. It is one of my favorite dish in all of time. I can’t wait to try this. It is one of my favorite item on the manu of ‘lasagna’ That is totally used instead of pasta noodles. I will make this with your lentil bolognese sauce. Thank you so much for everything to do. OOOMMMMGGGG, Dana! This was sooo yummy! I made it last night for thanksgiving and everyone loved it! I used blanched almonds and it tasted like real ricotta..well, how I remember it to taste, anyway. Thank you so much for this recipe, I can’t wait to try different variations of it! I made this last night. I wasn’t expecting much, because a lot of vegan food out there requires a fair bit of self-deception (have you tried the vegan cheese they sell? Ugh!). But this was really great! I used cashews because they’re cheaper than macadamias. I recently realized I have a sensitivity to nutritional yeast. I was wondering if there’s anything vegan/gluten free that provides a similar flavor. Not necessarily for this recipe, just in general. I was able to convince my family to eat a lot of vegan meals when nutritional yeast was used. This dish was fantastic!!! My only struggle was getting the “riccota” to be smoothed out. Every time I tried to smooth it out over the noodles it would move the zucchini all over the place. Suggestions? I suggest dolloping it in spoonfuls and gently spreading with a rubber spatula – good luck! Most incredible!!! Flavors and textures are spot-on! Made this for dinner tonight and it came out super soupy. Any ideas where I went wrong? Hmm, not sure! Perhaps it was your sauce? Use a thicker/chunkier one next time? I can’t wait to try to and I’m gathering the ingredients to make it this weekend, but I haven’t seen where you said what size pan you used. Could you share that please? Thanks again for another great recipe! You rock! Sure! Mine is slightly smaller than 9×13, but anything in that range will do! This lasagna with the macadamia nut ricotta cheese was absolutely the most delicious and creamy lasagna ever! I took a chance and made it for company without trying it first and none of us were sorry!!! It is now a staple in my dinners!! You won’t be sorry if you give this a try. It did, however, take me longer prep than 20 minutes. I’m still not sure how that time is figured but STILL worth it!!! Okay, I just made this mere minutes ago, and it was AMAZING! (The macadamia nuts kinda broke the bank, but oh man, they were worth it for a special treat like this. I’ll try it next time with almonds, though, just to see how it matches up.) I kicked it up a notch by making it with the sauce that you can find in the Bruno Albouze recipe for ratatouille on Youtube. (Charred peppers as a base? Um, yes please.) I have now happily devoured two portions of it and am not totally not sharing the rest. I might buy a mandolin for the next time just to make my life easier, but the uneven slices still cooked through perfectly and the differences in size doesn’t bother me at all. But Dana, I need your help. You’re my only hope, Obi-Wan Kenobi. My boyfriend has deathly allergies (of the anaphylactic shock variety, which is super fun) to dairy, eggs, and peanuts. He’s not sure about other nuts, so he’s cut out all of them entirely except for almonds, which are safe but need to be purchased from a peanut-free company. This means that cooking for him is hard! I’ve got the baking side totally down, but I’d like to be able to make meals that we can share. So much vegan cooking asks for nuts as a replacement, such as this recipe. (It doesn’t help that he doesn’t like tofu.) Do you know if there’s any good dairy substitutes out there that are not nut-based? Are there any entrees on your blog that don’t have those things? (I think I’m gonna look through everything that has your garlic dill sauce, which is amazing, and see if I can make those, like the sweet potato and chickpea dish.) Pasta with tomato sauce and “meat + veg side dish” get boring fast! I hope I read this correctly, but what about soy? Can he do tofu? If so, firm tofu makes a great replacement here! This looks absolutely delicious. I have always loved macadamia nuts and they are full of nutrition. I’m also quite obsessed with zucchini at the moment so I must try this recipe. It looks fantastic. I made this today so I’d have lunches for the week. It’s extremely low calorie if you use tofu for the ricotta, which is great for me as I’m trying to lose some weight. I used your parmesan recipe and pretty much covered the top layer with it so that it was almost like a bread crumb coating. I was a little nervous about how it would turn out, but it was delicious! I will definitely be making this again. I made this using Kite Hill ricotta. Amazing. Per usual with your recipes. Thank you!!!! I made this last night using macadamia nuts and it was great! I’ll be honest when I went to the store and saw the price of raw macadamia my eyes bugged out, but I always say to follow the recipe then adjust next time. I may try a mix of the almond and macadamia next time. I have tried a tofu ricotta before (not your recipe) and I hated it. I try to steer as far away from tofu as I can. The macadamia is a perfect sub! I actually forgot to add the extra water in the dish but it was still amazing (a little rich, but that’s nuts). I also didn’t have a mandolin and just hand cut everything. I would definitely say my cutting skills are subpar, but that gave me some thin pieces and some thicker ones that still had a slight hardness. It added a nice extra texture to the dish. I made this tonight and it was OUT OF THIS WORLD!! I added some quinoa that was left over from last night’s dinner. Next time I might add some kale but no matter what, next time I am going to double the recipe becaue it is SO GOOD!! Thank you for another FANTASTIC recipe! This lasagna is so delicious and easy to make! We have a couple vegan kids and they were to thrilled to taste that “cheesy ricotta” filling. I’ll be making it this week too, at their request! I just wanted to stop by and tell you that you’re doing an amazing job. I’ve received countless compliments on the food I make from your recipes :) You’ve made my transition into a vegan life style so painless. I recently made this recipe for my whole family and they absolutely loved it. My boyfriend’s mom (who’s not vegan) even went as far as saying that it’s the best lasagna she’s ever had. Thank you so much for everything you do, myself and many others appreciate all your effort. Can’t wait to see what else your genius brain comes up with! I made this with your lentil bolognese sauce (my husband’s favorite!) and it was outstanding!! So delicious! We made this tonight with the tofu. Bf has a severe macadamia nut allerfy. Super tasty. We used a spicy spaghetti sauce and zuchini noodles. Reminded me of calabacitas. Excellent and very easy, even without a mandoline. I used tofu in place of cashew ricotta but I added the cashew parmesan for topping. What a HIT! Great and flavorful! I wanted to — and WILL — follow this recipe exactly. But last week due to likes, dislikes and namely time constraints I made it with regular ricotta and added lightly salted ground beef. I alternated layers of zucchini and eggplant and mmmmmm! After I soaked up a good amount of excess water that was released from the veggies with paper towels this was EXCELLENT. Easy, quick and delicious. Thank you for posting amazing recipes. Would I process the tofu if I opted to use it instead of the macadamia nuts ($$$)? Yes! In the blender or food processor. This was delish! I will never use normal lasagna sheets ever again. I tried this recipe last night and it was INCREDIBLE. I chose to use tofu and the ricotta turned out phenomenally well. Tasted almost exactly like the real thing. Thanks so much for the recipe. It’s gonna be a staple. This was SO GOOD! Followed the recipe exactly except added lasagna noodles & extra sauce. My dairy intolerant teenage son raved about it and wanted to eat the entire pan. I think this has more flavor than cheese-loaded lasagna. THANK YOU! I will also try today thank you!! What the heck does “seam side down” mean? There was an extra unneeded sentence in there! Amended. Thanks for the question! Amazing! I made this tonight, using tofu in place of macadamia nuts and it was SO DELICIOUS. I made my own marinara sauce as I didn’t have any bottled, and the whole dish came out creamy and incrediblyyy flavourful. I also decided to make it with your pesto bread sticks as recommended and, though I might have burned my pesto, it was the perfect combo! Looking forward to bringing this to work for lunches for the next couple of days. Thanks for the recipe(s)! Lovely, Justine! Thanks for sharing! This recipe is BOMB. So freaking delicious and fun to make. Very excited to try in the future with eggplant and sweet potato! The macadamia nuts are WORTH it. Will this recipe work if I alternate layers of zucchini with layers of gluten-free lasagna noodles? Would I have to add more tomato sauce to compensate for the noodles? I’m gonna try this. I did it with your sweet potato recipe and didn’t care for it (but that makes sense because I don’t really like sweet potatos or tofu LOL – should’ve thought it through). Will be back after I’ve made it. I would love to feature this recipe on a fall recipe round-up in an email to my audience. I am seeking your permission to use one of your pictures from this recipe in my email and to link back to your page. Let me know if I have your permission. Thanks! I made this today and it was delicious! I used tofu instead of the nuts. It did come out a bit watery even after pressing it for a bit. Any tips on how to get it less watery next time? This was so good. I used tofu to save money but will splurge on the macadamia nuts next time so that it’s soy free too. Mine was also a little watery, but it didn’t take away from the flavor. Definitely keeping this recipe!! Love this! Absolutely cannot wait to try it?? Ahhh, my mouth is already watering! Zucchini Lasagna is one of the staples around my home and I’m super excited to try a macadamia nut version. The pictures look absolutely delicious. I’ll let you know how it goes! I made this with standard cheeses and it was delicious! I wonder if salting the zucchini slices would have much differences in the amount of liquids produced while cooking? This didn’t effect the flavor in any way, but it did cause the tomatoe sauce to spill slightly from the pan to the oven floor. Just wanted to add that I substituted 1c chickpeas in with 2 c macadamia nuts and it’s delicious! Trying to keep costs down (those nuts are $$), and also add in a little more protein and fiber! You can hardly tell the difference. Oh my this looks delicious! I have a question about nutritional yeast, maybe I have a bad brand (I believe it’s called now) but I really don’t like the taste of it. Even in small amounts I seem to notice the flavor. And substitute recommendations or maybe a different brand I should try? Thank you!! I have made vegan ricotta without the nutritional yeast. I just adjust the salt, lemon, garlic powder to my taste preference and it works fine! Thanks for the tip, Kayla! I made this last night and boy was it delicious. The macadamia nut ricotta was so tasty, I love the nutty flavor. My husband loved the dish. It came out a little bit watery. I think next time I may salt the zucchini and squeeze it with paper towels to pull out some of the water. I will definitely be making this one again. Thanks for the great recipe! I have a lot of basil to use up and was looking for a way to use it besides pesto. Can’t wait to make this today and have it all week. Thanks for the recipe! I just made this today and it was AMAZING!!!!!! Can’t wait to make it again for my next dinner party…… Love your work. ❤️? made this tonight but I used pressed tofu. I also added sautéed spinach and mushrooms to my layers. like all your other recipes this one is a keeper. very delicious and satisfying. thank you for sharing your recipes with us.? Not sure if any of you are aware that KITE HILL makes a almond milk ricotta that is outstanding. Once you mix it with parsley and FOLLOW YOUR HEART VEGAN PARMESAN CHEESE you would never know that it is not dairy ricotta cheese. I am not a fan of TOFU nor do I want the SOY in my diet so the KITE HILL ricotta is awesome! BTW KITE HILL is only available at Whole Foods. FOLLOW YOUR HEART makes 2 difference varieties of parm cheese, a sprinkle and a shredded. I believe neither are made with nuts. Thanks for the tips! I like to promote homemade cheese alternatives, but I’ve heard good things about Kite Hill if you can find it! I found Kite Hill ricotta (and other products) at our local Co-op in Arcata and Eureka, California, so check your local health food stores or Co-ops if you are interested in trying Kite Hill. Where do you get the Kite Hill parmesan? Kite Hill does not make a parmesan (not that I am aware of) However, Violife make a parmesan which is available at most Whole Foods. Also, FOLLOW YOUR HEART make a shredded parmesan as well as a shaker version. Also available at Whole Foods. Good to know. Thanks, Joey! This recipe is a twist on one in the amazing “Everyday Cooking” by Dana. I have made this many times with tofu and it is a staple in our home! I roast all the veggies before hand bc I like it better. I have used zucchini, yellow squash, sweet onions (slice thin and use a tooth pic to keep the rounds together for roasting), baby portabellas (pan sautéed), and layers of fresh spinach (raw). And yes, all in one very tall lasagna! The cashews work as well, as before I had the book I used Dana’s herb cheese dip recipe as a ricotta and it worked well (though I didn’t soup it up like Dana does above so this will be a big improvement)! My family loves this. I take this to potlucks and the omnivores cannot keep their forks away! I also made many and frozen (with the August zucchini haul). I just bake for 30 min, leave covered in foil to cool and freeze. I have cooked from frozen and thawed. Always amazing! We made this and it is great. We used our own 50/50 cashew/tofu blend in the ricotta recipe, but otherwise followed the recipe. We have a local restaurant which has an entire vegan menu in addition to their regular fare (and it’s a martini and wine bar of all things!). One of our favorite items on the menu is a “lasagna” that uses very thin slices of extra firm tofu instead of pasta noodles. As I read this recipe I thought about a combination of the zucchini slices and the tofu slices in alternating layers as a way to make it a little more filling. Could I use regular ricotta cheese with this recipe if i plan to make this for people with nut allergies and problems digesting soy? How much cheese do you need to make the substitution? We would estimate about 1 1/2 cups. Hope that helps! You guys, I made this last night and it is DELICIOUS. Leftovers are also DELICIOUS. All in all, the dish turned out a bit watery for me, but that is probably due to my refusal to properly press/dry tofu (used tofu instead of mac nuts for the “ricotta”. The wateriness doesn’t even matter though – I ended up draining out the liquid when I was packing it up last night, so it seems like a totally un-watery dish today. Oh AND I did not use a mandolin because 1) I wasn’t sure what that was, and 2) when I googled it I was pretty sure I could do the same thing with a knife. It resulted in inconsistently-sized zuc slices, but again, this didn’t matter at all (in my opinion anyways – also my kitchen is home to imprecision). What if you don’t have a mandolin? How thin do the strips need to be? Hi Holly, you could slice the zucchini into thin strips with a knife! I had the most delicious vegetarian/vegetable lasagna in Paris and keep meaning to try to replicate it. This recipe looks close! I might try to do even more layers, like a mille-feuille. I’m WAY into this recipe! And perfect for those “what-am-I-going-to-do-with-all-these-zucchini” situations! I will be making this next week! This looks amazing! Can’t wait. Can is substitute macadamia nuts with cashews? Macadamia nuts are toxic to dogs so I don’t allow them in my home. This dish looks so delicious. Must make this weekend. I would soak the cashews for 30 minutes in hot water, but I also haven’t really tried that yet. I also think you can use blanched almonds but haven’t tried that yet either! Let me know how it goes! Reporting back: Made tonight with blanched almonds. Turned out amazing. Thank you so much for another incredible recipe. This is exactly what I needed! 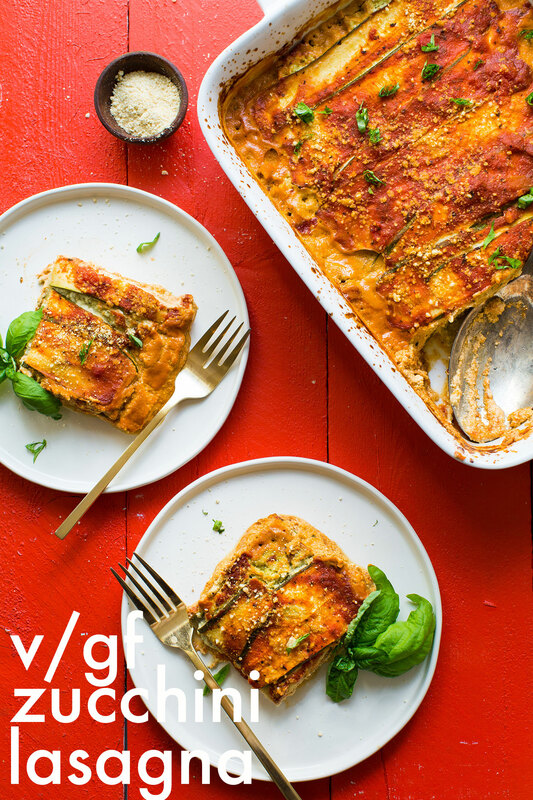 I’ve been looking for some more cosy autumn dishes that aren’t 100% carbs, this lasagna looks so tasty – thank you! Can you sub the macadamia nuts with cashews? Will it alter the flavor to drastically? I think so! If you’re trying, I would soak the cashews for 30 minutes in hot water then train, but I also haven’t really tried that yet. I also think you can use blanched almonds but haven’t tried that yet either! Let me know how it goes! are the calories for it with macadamia? If so, do you have it for with tofu? One of my favorite dishes of all time! I love that this one is so simple and easy to make + it looks absolutely delicious! Thank you for sharing! This looks good, I just wish macadamia nuts weren’t so expensive! Oh man! We’ve been watching our carbs but craving lasagna! I can’t wait to give this one a shot. This looks great! I don’t have any macadamia nuts… could cashews be used instead? Would they need to be soaked or could the same technique be used? definitely wish i had soaked my cashews! this gave my VITAMIX a fit!! i have done it with 1 cup of cashews before and it was fine! i guess 3 cups put it over! haha! next time…soak them! I’m now struggling which to try – cashews or with the original macadamia nuts. Macadamia nuts are $16.99 a pound where I live, but yes, they are beyond fabulous and I would take them as a birthday gift any day. But cashews would be cheaper. Regardless, this recipe is fabulous and a wonderful way to start my weekend! I used 1 cup macadamias, 1 cup soaked cashews and about 3/4 cup organic tofu (drained and pressed) and it turned out fabulous! I didn’t have 3 cups of any of the 3 items, so mixing produced a great tasting result! I also added a large clove of garlic. The macadamias need to be soaked too? Sorry, I just read that is not necessary! I used blanched almonds and it was delicious. I used cashews and it was so good!! I was too cheap to buy macadamia nuts…? Thanks! Good to know! I’m changing things up a bit- going to use cashews for the ricotta, no-cook lasagna noodles and veggie crumbles seasoned with onions, gr. peppers and fennel. I’ve made the recipe as- written though and it’s fantastic! So happy to see that the ricotta is cashew free as I am allergic. I can’t wait to try this!